Give personalized journals, custom notebooks and leather writing journals as gifts. Journals can be personalized with your unique text or logos. 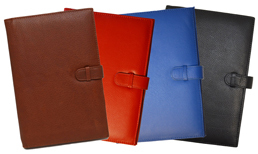 We have leather writing journals with blank or ruled pages for both men and women. Inexpensive durable journals available for kids. Personalize one for your child to use as a diary or travel journal. We manufacture a wide variety of journals, notebooks and diaries; from custom printed covers to your logo on every inside page. 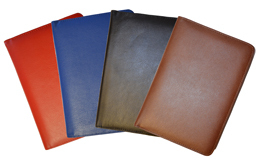 Call us for pricing on custom journal books! PersonalizedJournals.com ©2013. All rights reserved.